Produced by David Barratt at The Abattoir Mobile from original recordings made by Joseph CR Vourteque IV. First, I would like to thank you for your song, ‘Octopus’ Garden.’ It is really quite a lovely melody and has served as a nice little pick-me-up to many of my fellow octopi who sometimes feel our gardening may not be fully appreciated by the surface dwelling world. To have our modest hobby singled out for a song by your rock and roll band has been quite a treat. However, in the interest of safety and correctness we do believe we must correct some misconceptions that have arisen from your song. First, while many refer to them as ‘gardens’, that name may be misleading to non-water-breathers. It is my understanding, from the scraps of faded books that sometimes descend to this level of the deep, that a ‘garden’ to you implies an grassy area filled with flowering plants and vegetables. I assure you our gardens are not at all so dreadful. What we octopi consider our gardens are lovely piles of the chitinous husks of the creatures we have devoured. They are arranged in a delightfully haphazard way around the entrances of our caves or holes. The second inaccuracy I’d like to point out is that your lyrics state the garden is ‘in the shade’, which technically is true, but a more accurate description would be that it is a lightless, heat-sucking abyss – just the way we like it. I must also warn you, we octopi are generally quite a timid lot. We rarely welcome guests, and if visited unannounced we have a (admittedly quite embarrassing) habit of squirting them with ink and running away. So I must ask, if it would not be too much trouble, if you might change your song ever so slightly to make visiting one of our gardens a little less attractive. Might I suggest the following change; the lyric "We would be so happy you and me, no one there to tell us what to do" might instead read "We might be, so happy you and me, unless we’re dowsed with viscous, inky goo." But please excuse me, it is incredibly presumptuous of me to try to tell you, one of the most famous musicians in the world, how to write a song. I’ll make you a deal, I will leave all of the song-writing to you, and if you ever find yourself in need of advice on how to tastefully arrange the corpses of molluscs, I sincerely hope you would come to me. "A sharp blade is a safe blade," before collapsing in a paroxysm of laughter. The Lord Baron Joseph C.R. Vourteque (IV) is a Chicago based DJ, producer, remix artist, promoter and maker. He’s one of the principal founders of Steampunk Chicago and the main producer and director of many of their events. 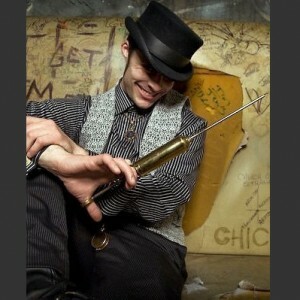 He’s also a member of The Lords & Ladies Djs, Steampunk Chicago’s resident DJ group. Vourteque has been remixing, producing and DJ since 1998, having worked in virtually every style of popular music and dance music out there. 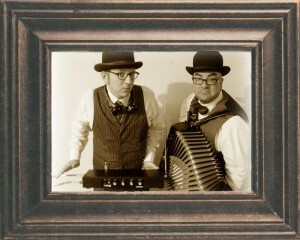 As of late he’s become known as a sought after producer and remix artist for the steampunk movement. He’s done remix work for Lady Gaga, The Men That Will Not Be Blamed For Nothing, DeVotchKa, The Clockwork Dolls, Houston Bernard, Yellow Note amongst others. As a DJ he’s played throughout the east coast and midwest of the United States and is in the planning stages of a month long tour for the middle part of 2012. For more information check out www.Soundcloud.com/Steampunk-Chicago-Djs or www.SteampunkChicago.com. "There was a mighty eddying and foaming in the noisome brine, and as the steam mounted higher and higher the vessel drove on against the pursuing jelly which rose above the unclean froth like the stern of a daemon galleon. The awful squid-head with writhing feelers came nearly up to the bowsprit of the sturdy yacht. There was a bursting as of an exploding bladder, a slushy nastiness as of a cloven sunfish, a stench as of a thousand opened graves, and a sound that the chronicler could not put on paper. For an instant the ship was befouled by an acrid and blinding green cloud, and then there was only a venomous seething astern; where the scattered plasticity of that nameless sky-spawn was nebulously recombining in its hateful original form, whilst its distance widened every second as the Alert gained impetus from its mounting steam…"
H.P. Lovecraft – The Call of Cthulu, 1928.